Louise Richards Farnsworth was an artist known for her brilliant Figurative-Expressionist landscape paintings. She was born in 1878 and grew up in Salt Lake City, Utah, and trained first at the Art Student’s League in New York and then in Paris. Her work was admitted into the Paris Salon, a prestigious honor in the international art world. 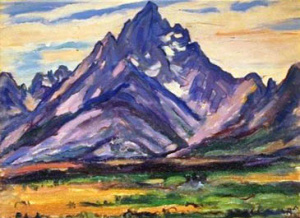 Louise was not accepted well in Utah, partially because it was rare for a woman to study art. 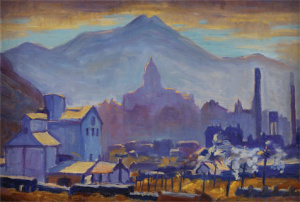 She never had a major exhibition of her work in Utah and did not associate with other Utah artists, except her cousin Lee Greene Richards, who influenced her artistic development. She had her first solo exhibition in 1934 in New York at the Montross Gallery, with a second in the Stendhal Gallery in Los Angeles in 1936, and a third also at the Montross Gallery in 1938. She married lawyer Philo T. Farnsworth, cousin of the famed inventor by the same name. She died in 1969. She was a member of The Church of Jesus Christ of Latter-day Saints. Her grandfather was early Church leader Willard Richards. This page was last edited on 30 January 2017, at 20:44.